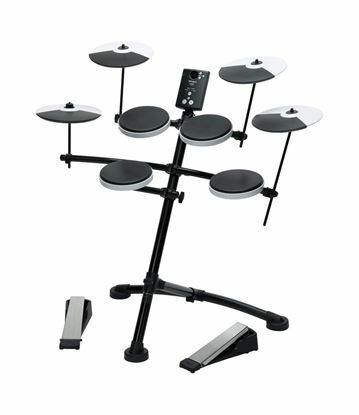 The Carlsbro CSD130 5 piece Electronic Drum Kit is a game changer. 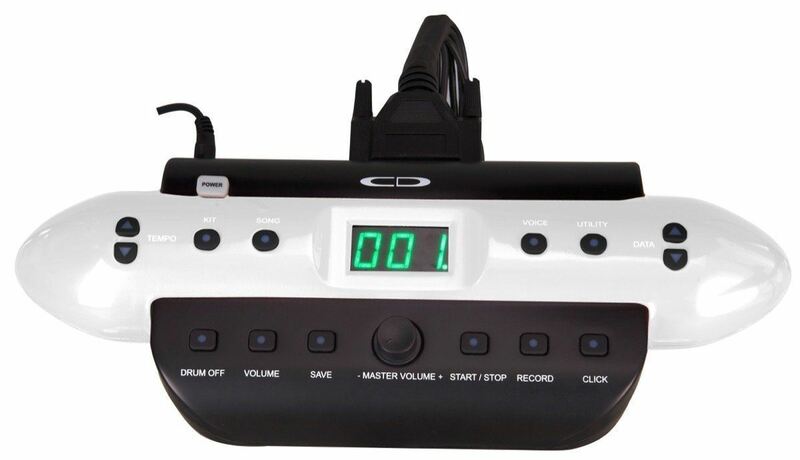 No other Digital Drum Kit comes close to the features and sound quality of the CSD130 at this price. At the heart of its advanced functionality is the Tri-Zone Snare Trigger Pad. The subtle nuances that make a snare drum come alive and lets you get greater musical expression out of your electronic drum kit are here including the ability to play a full snare shot with velocity sensitivity, an open rimshot and a closed rimshot. This special trigger pad features a large 7.5″ surface with plenty of space to play. Both ride and crash cymbals are single zone design with choke making them extremely expressive. The Carlsbro Commander 130′ sound module features a multi function Digitron LCD display & USB interface with midi in/out. It offers comprehensive control with a master volume plus one accompaniment and percussion volume. On board are 250 CD quality percussion voices, 20 preset kits and 10 user defined drum kits, 20 demo songs. Fully adjustable metronome, real time recording and play back facility. Reverb and trigger curve settings. There is also adjustable sensitivity and crosstalk controls for fine tuning of the pads. The Stereo headphone output allows effortless silent practice and you can connect your MP3 player to the Aux.in for MP3/CD playalong (an optional connect cable may be required). For live performance or just jammin’ with the boys (or girls!!) there are a pair of stereo Left/Right outputs. Taking a cable out of the Left out only allows you to plug staright into a single Amplification source. A 9V DC power supply is also included as well as an ultra compact and portable, heavy duty 3 legged drum rack. Heavy duty hi-hat and bass drum pedal controllers as well as all mounting hardware and cables are also supplied. Stylish and innovative is an understatement… CD engineers listened to drummers all around the world and combining innovative technology have created astounding electronic kits that deliver what today’s drummers expect, enabling you to experience that acoustic drum feel. 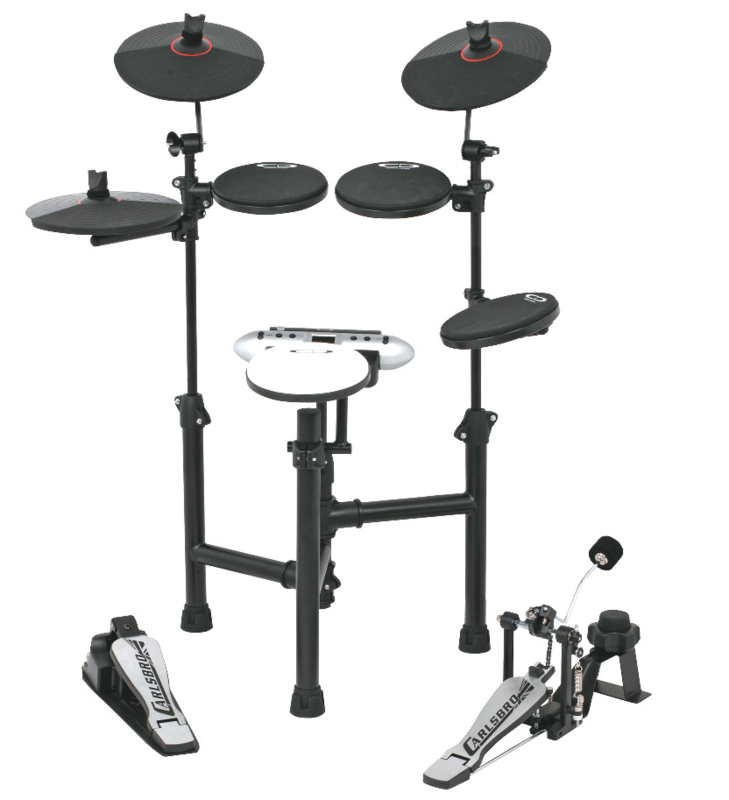 The Roland TD1K is the world's most popular electronic drumkit. Roland have had 30 years of dedicated drum development under their belt so that you know you have the best there is, whether a beginner or professional drummer. 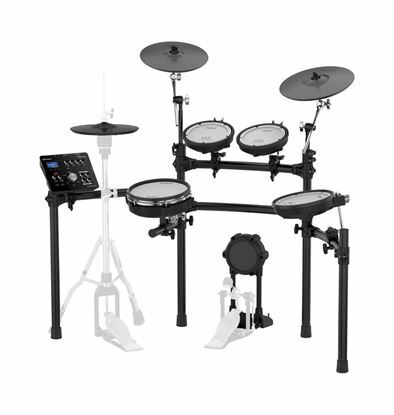 This is an electronic kit that the serious drummer will love, particularly as a practice kit.